Backwaters are the main attraction of Alleppey and Kumarakom. One can see large deposits of shells, that are usually found in the sea. It comprises a number of islands in the backwaters. Kumarakom is one of the few places in the world where the means for transportation is through boats. Kumarakom is blessed with the Vembanad Lake which has its majestic canals, streams and distributaries along its banks, weave an intricate and enchantingly beautiful web. Capture the beauty of the backwaters. The cruise through palm-fringed narrow canals, the unique life of the backwater people and above all the nature around you will make long-lasting impressions in your mind. Overnight stay in a houseboat. 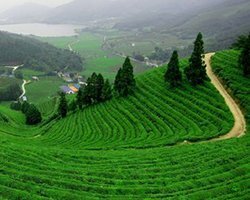 Halts at the best places in Kerala tour Kumarakom, Alleppy and Munnar. Your Backwater and Tea Garden Tour . Upon arrival our representative will greet you at Kochi Airport/Railway Station later proceed to Kumarakom. Reach & check in at the hotel and relax for a while amidst the comforts of your room. Kumarakom is one of the few places in the world where the means for transportation is through boats. Kumarakom is blessed with the Vembanad Lake which has its majestic canals, streams and distributaries along its banks, weave an intricate and enchantingly beautiful web. The major attraction of Kumarakom is the Bird Sanctuary which lies at the edge of the grounds of an old estate where a profusion of all kinds of birds can be observed. Domestic birds such as cuckoo, wild duck, egrets, darters, herons, teal, and water fowl can be seen in abundance here, and the Siberian storks which migrate to this place each year. Overnight stay at the Hotel/Resort. Check out of the hotel from Kumarakom by 10.30am and proceed to Alleppey to check in to the Houseboat for a 20 hour long cruise through the world famous backwaters of Kerala. Houseboat (Kettuvalloms) is a indigenously developed and designed private boat with fully furnished spacious bath attached bed rooms, hygiene kitchen ,dining area and private front deck to capture the beauty of the back waters. The cruise through palm fringed narrow canals, the unique life of the backwater people and above all the nature around you will make long lasting impressions in your mind. Overnight stay in a houseboat.